Use: Teaches you how to summon this companion. Limited to servers in China. 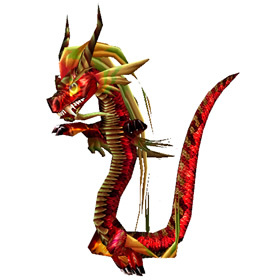 It is believed that this pet was available through an iCoke promotion that coincided with the release of World of Warcraft in mainland China. It is assumed that recipients of this promotion were given the choice of this pet or its green counterpart. Overwhelms the enemy with draconic breath, dealing 413 Dragonkin damage. Deals 354 Dragonkin damage, or 492 Dragonkin damage if the user strikes last. Deals 492 Mechanical damage and causes a Lightning Storm for 5 rounds. During a Lightning Storm, all pets deal 39 bonus Mechanical damage on each attack and Mechanical abilities deal 25% additional damage. A fierce roar deals 197 Beast damage and enrages the user, increasing the damage they deal by 25% for 3 rounds. Creates a cyclone which has a 35% chance to deal 118 Flying damage to the enemy team each round. Fly up high, becoming unattackable for one round. On the next round, you attack, dealing 591 Flying damage. Dragons deal 50% additional damage on the next round after bringing a target's health below 50%. I should've played a chinese server or something. That pet looks SICK! Said to bring good fortune when spotted in autumn. Known to hide from unfamiliar creatures.